Frank Stockton was born in Philadelphia, Pennsylvania, on April 5, 1834. Does his name not sound familiar? His stories will. Well-known in his day as a humorist and short-story writer, he was also the assistant editor of Hearth and Home, Century Magazine, and St. Nicholas magazine, where he worked with editor Mary Mapes Dodge (the author of Hans Brinker). 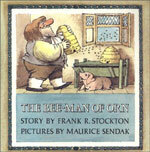 One of his notable children’s titles is The Bee-Man of Orn and other Fanciful Tales, first published in 1887. More recent versions have been illustrated by Maurice Sendak and PJ Lynch, which was published in 2004 by Candlewick. He also wrote “The Lady or the Tiger?” and “The Griffin and the Minor Canon,” stories most children study in school. In his day, the only authors who were more popularly read, according to librarians, were Mark Twain and Frances Marion Crawford. During his lifetime, he worked very hard to secure an International Copyright for authors. Mr. Stockton died in 1902. The author he most admired was Mark Twain—Sam Clemens attended Stockton’s funeral.